The roof no longer needs supports while first segment of membrane was laid on top of the stadium. Rostov has to be ready a year from now. Yesterday the company overseeing construction in Rostov, Sports Engineering, released images of the first membrane strip spanning proudly above stands of Rostov Arena. It’s only the first of 46 and it covers 300 square meters over the north-east corner. Eventually the company claims to require 49,500 square meters of similar sheets, though the roof surface itself is significantly smaller. More importantly at this point, though, the roof is structurally ready. In late October the entire steel skeleton was finished and dismantling of temporary support pillars began. The last of yellow towers should be taken down by the end of November. so far there is no information about the predicted finish of roof cladding, but lowering temperatures may interfere with plans on the site. The PVC sheets change their properties depending on weather, while it’s almost freezing nowadays in Rostov (just above 0°C according to forecasts). 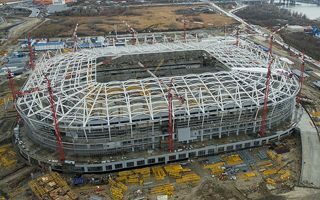 Rostov Arena is expected to be complete by the end of 2017, with handover scheduled for late December. The stadium will hold 45,000 people for the duration of 2018 World Cup and should be slightly downsized to 37,885 after the FIFA tournament.